She directed the first series of Brat Camp, and her list of credits includes Lads Army, That’ll Teach ‘Em, Channel Four’s Dispatches and Millionaires’ Mission! Tamara was born in Pakistani, and before embarking on her career in television was a practising solicitor. Tamara will sharing with us behind the scenes explanation of producing multi-million series. 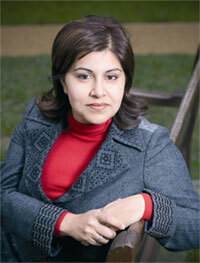 Baroness Sayeeda Warsi is Shadow Minister for Community Cohesion and Social Action and is a member of David Cameron's Shadow Cabinet. She is a former Vice-Chairman of the Conservative Party and is Shadow Minister for the City of Sheffield. In December 2007 Sayeeda participated in the successful mission to the Sudan to secure the release of the British teacher, Gillian Gibbons. Sayeeda regularly appears in the broadcast media, including BBC's Question Time and Radio Four's Woman's Hour. Sayeeda has also written articles for the national and regional press.